A new report demonstrates to policy makers which countries are best at helping traditional families and which are failing. The UN acknowledges the traditional family structure of a married mother and father raising their children as the “natural and fundamental group unit of society.” A growing body of social science research affirms that individuals thrive when families are strong, and all of society reaps the benefits. This week a group of European scholars launched a report examining the state of the family throughout the world by creating an index evaluating both the characteristics of family structures between countries and the availability of resources and policies that support strong families. The index draws on multiple indicators of family structure and stability, including birth rates, marriage and divorce rates, and survey data about the level of trust and interdependence within families. It also examines the policy environment and resources in support of the family, such as employment rates, work-life balance, and the presence of a tax deduction for children. Based on the combined index scores, Denmark ranks first out of the 46 countries evaluated, with the United States and Canada ranked much lower, at 29 and 36, respectively. The majority of countries analyzed are European, but the inclusion of the lone African country Malawi reveals an important finding: it ranks first in terms of family structure despite being second to last in contextual resources, such as fiscal policy for the family and public care services for children and the elderly. 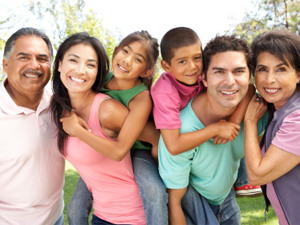 Acknowledging the fact that people live in a variety of household and relational structures, and the ongoing debate over the definition of the family in policy, the authors of the IGIF focus on the aspects of the traditional family that make it essential to society: that it is where children are born and raised, builds on a conjugal sexual relationship, and involves reciprocal and unconditional generosity within strong lifelong bonds between generations. The authors hope that their index will help pro-family delegates support better policies for their countries during ongoing UN debates about how to operationalize the Sustainable Development Goals. At the High Level Political Forum in New York this week, UN delegates are debating what gets measured therefore what will get funding in the decades to come.